Home » Sports » A Buffalo Team With Money? Near the mid-way point of last year, the Sabres were purchased by a guy who has made his fortune in the business world, who also happens to be a Sabres’ fan. Terry Pegula sat in the stands as a season ticket holder for a couple decades, watching his favorite team do well, but never well enough to bring home the Stanley Cup. When the Sabres were up for sale, he did what probably most every avid fan would love to do … he bought his favorite team. The crazy thing is, though he is certainly not wanting to lose money from the business side of his new sports franchise, as a fan of this team (and hockey in general) and as a man with apparently abundant supplies of cash, he doesn’t only want to make the Sabres competitive. He has repeatedly stated that his only goal is to win a Stanley Cup in Buffalo. Many Stanley Cups. Pegula has been personally visiting the players that the team is targeting to bolster their roster. That is clearly important to him. The players, the management, and nearly everyone in the organization is impressed by how personally involved (and involved passionately) he has been. It could be a reason that the Sabres have signed a couple players already, even before free agency starts at noon today. The Sabres have already shown a commitment to improving their ‘D’. Trading a couple young guys (including defenseman Chris Butler, whom I was hoping they’d somehow move…) to the Calgary Flames for D Robyn Regher, a tough, veteran D-man. 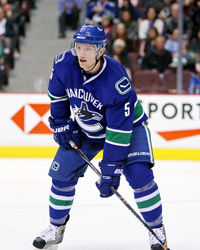 (They also got former Sabre forward, Ales Kotalik in the deal, but not sure where they are going with that.) And just yesterday, the Sabres signed soon-to-be free agent D Christian Ehrhoff (likely one of the top free agent defensemen) to a multi-year deal after acquiring his negotiating rights from the Islanders (who were apparently unsuccessful in their attempt to sign him). The Sabres—at Pegula’s direction—are on the move. And I don’t think they are done. They have been signing a few players that are currently on the roster. After signing Regher and Ehrhoff, they also traded D Steve Montador to Chicago for a conditional draft pick. And then today at noon, free agency begins. The name everyone is throwing around is Brad Richards. If the Sabres want him, I would expect that they will be a player in the quest to acquire him. (How strange is it, Buffalo fans, to have an owner that has money and wants to spend it!?) It’s conceivable the Sabres would pursue him as they really don’t have a #1 center (even though Derek Roy had a very productive season last year, despite missing about half of it due to injury) and they also lack “star power”, which this veteran forward would bring. There still is a salary cap, but expect the Sabres, with their new deep-pocketed and fairly aggressive ownership to pursue the best available players. It wouldn’t surprise me if they make another trade or two here this offseason as well. Hopes are high here in the Buffalo sports region. The Sabres have not been as frustrating as the Bills have been recently, but there has perhaps not been as much hope as there seems to be now. And with apparently good reason. Regher and Ehrhoff make the Sabres better. And the team is not done. When the clock strikes noon today, the Sabres will be looking to further increase their chances of bringing home the Cup. That is, of course, everyone’s goal. But right now, it looks like more of a real possibility for Buffalo than it ever has.